Update: Also check out our review of Isolator. Today’s computers are marvels of technology that can perform more tasks—and more different kinds of tasks—than ever before. Not only that, but your Mac can be doing more and more of those tasks simultaneously—you can have 15 or 20 applications open without the computer even breaking a metaphorical sweat. Ironically, all this activity is enough to drive you to distraction, potentially reducing your productivity. I wrote that paragraph when reviewing Think, a utility (no longer available) that aimed to help you focus by displaying only a single program at a time, hiding everything else behind a black backdrop. Since then, we’ve covered a few other programs for helping you focus, such as Shoo Apps, which automatically hides applications that haven’t been used recently, and WriteRoom, a text editor that blocks everything else on your screen so you can concentrate on writing. While I’ve appreciated the appeal of utilities such as Think, Shoo Apps, and WriteRoom, I’ve never been able to work them into my personal workflow. I like the way they let me focus on the frontmost task, but my work often requires me to reference a background window while writing or to keep an eye on one app while working in another. 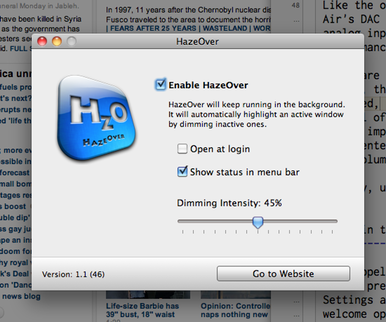 If you're in the same boat, you’ll want to take a look at HazeOver (Mac App Store link), a nifty utility that’s similar to Think, except that instead of completely hiding everything but the active window, HazeOver gracefully dims it all. HazeOver’s approach gives you many of the benefits of “focus” utilities without completely blocking other apps and windows. And HazeOver's gradual (approximately two-second) fade is easier on the eyes (and the brain) than an instant flip, although I do wish you could customize the length of the transition—I’d choose to make it a bit longer, whereas I’m sure some people would prefer a quicker change. HazeOver’s initial version was released just a couple weeks ago, so it’s still a brand-new app, and the developer is already working on enhancements. What’s on my wish list? Besides the adjustable dimming time I already mentioned, I’d like to see an option for HazeOver to not dim other windows within the same application—for example, sometimes I want to view multiple Safari windows while obscuring other programs. (An even bigger issue is that, for example, when I bring up BBEdit’s Find window, the Find window becomes the “focused” one, which means the actual document in which I’m working is dimmed.) I’d also like to be able to exclude particular programs so they’re never dimmed; an option to dim everything but the previous, say, two windows or applications (so I can focus on just the windows needed for a particular task); and a way to activate and deactivate HazeOver directly from its menu-bar menu or by using a keyboard shortcut. HazeOver also doesn’t work properly with every program. For example, when using Microsoft Excel 2008, HazeOver treats the document window, formatting palette, and data-entry bar as standard windows, and it considers the formatting palette to always be active—which means that if the formatting palette is visible, the main document window is always dimmed. Still, HazeOver is a clever utility with a lot of promise. With a few tweaks, it just may find its way into my workflow.